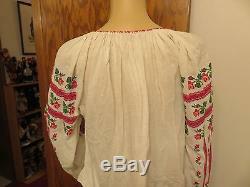 This is a lovely vintage (and based on construction details, likely antique) hand-made and hand-embroidered traditional Ukrainian folk blouse. 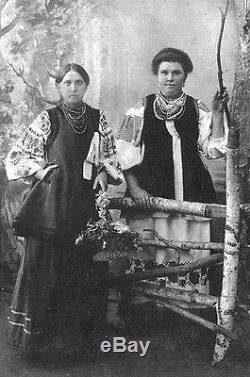 See the attached old pictures of Ukrainian ladies in traditional costumes that feature similar blouses. 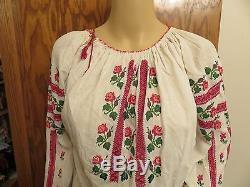 An ebayer has written to say that this blouse is Romanian. So, I will leave it that it is one or the other. 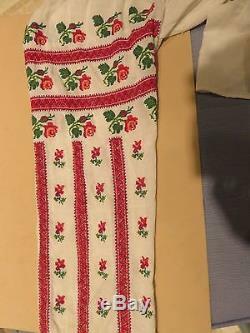 Like Ukrainian blouses, Romanian blouses are also often beautifully (and very similarly) hand embroidered with different patterns in tthe various regions of that country. 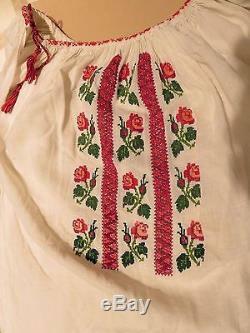 It is beautifully made and embroidered, and in a regional style that is very hard to find. And sadly, because of the wars, many were never worn. This one has no evidence of being worn, although it may have been worn by a very neat and careful lady. It is a very finely woven cotton , I think. It MAY be linen but I don't know for sure and as it is hand-made there are no labels or tags. The embroidery features roses in red and reddish-hues and a stem with a bud and two green leaves. This is a traditional motif in Central, Southern and Eastern Ukraine in particular. This blouse is constructed of six large rectangular pieces of cloth, with the blouse shape made by tiny gathers all around the neck. There are three rectangles in the front, (a wide one in the center and two more narrow ones on each side) one in back and two more are made into tubes to create sleeves. The sleeves finished are with a gusset at the armpit. The gussets are small squares that allow movement at the place where the sleeves meet the bodice. There is also a 2 extension along the bottom of the back panel that is also a rectangle. This is a very common traditional design in many parts of Eastern Europe... It has the advantage of not wasting even a tiny piece of fabric that one might traditionally have personally home spun and then woven at home. No cutting out arm holes and neck openings and stitching darts. Notice that the neck opening is just an opening along the right shoulder seam where the front panel and the sleeve join, with a colorflul red and black cord to tie it closed. 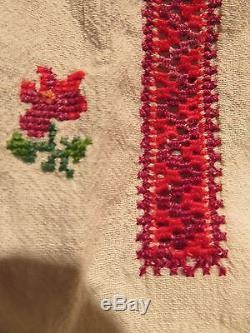 In addition to the embroidered rose motif on the front and sleeves , there are also rectangular areas of red, purple and white crosstitch with cut-work that is hand wrapped similarly to the Norwegian Hardanger embroidery. This construction technique maintains the strength of the fabric (by winding the cut edge completely with thread) but features tiny holes that are decorative, and that also breathe. " This is a benefit is one wears it to participate in folk dancing activities, plus the "all cotton aspect. There are two of these rectangles on the bodice and two on each upper arm. The neck opening is finished with a band of cotton that also features red cross-stitch embroidery. At the bottom in back there is a wide band that makes it easirer to keep the blouse tucked into a skirt. Widest bust measure (Side seam to side seam at the center of the gussets): 22" (44" total all around). Side seam to side seam at the bottom lying flat: 22. Length from top front and back of bodice to hem: 19. Sleeve length just from center of armpit gusset down to wrist: 14. Please see my other auctions... 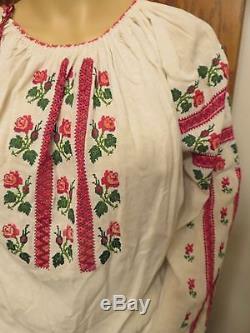 I have many ethnic / national / international / traditional folk costume items. The item "NM Antique Ukrainian or Romanian Folk Hand Embroidered Blouse Ukraine Romania" is in sale since Sunday, November 08, 2015. 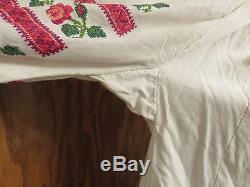 This item is in the category "Clothing, Shoes & Accessories\Cultural & Ethnic Clothing\Europe\Other European Clothing". The seller is "elsacaufield" and is located in Moorhead, Minnesota. This item can be shipped to United States.